Developer NRP Group and the San Antonio Housing Trust Public Facility Corp., a nonprofit run by five council members, are closer to an agreement that will result in a $56 million, 325-unit mixed-income apartment complex on the southern-most stretch of the San Pedro Creek restoration project. 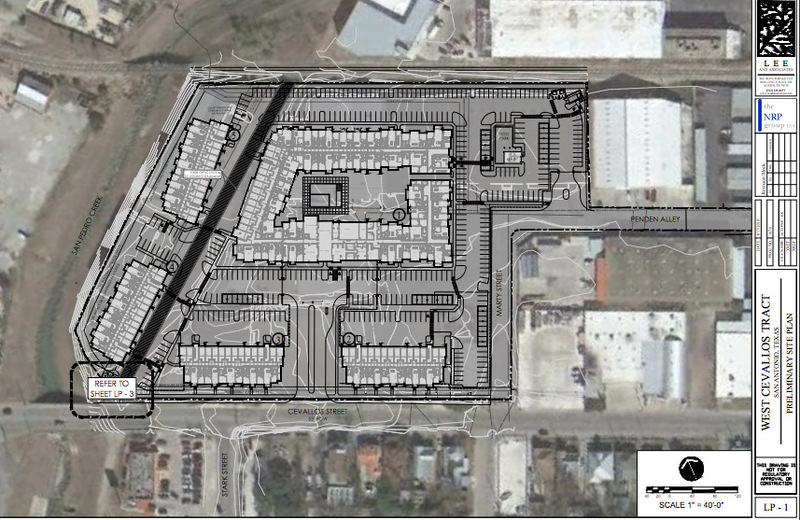 Under the 75-year lease agreement, half the units at West Cevallos Apartments would be rented to households making 80 percent of the area median income (AMI)—or, $53,440 for the greater San Antonio area—or less. In addition, 10 percent of the total would be reserved for households making 60 percent AMI, or $40,800—a requirement by the PFC board to NRP Group. A restriction would also limit their rent to 30 percent of their household income, although NRP Group and its partners can raise that to a cap of 35 percent at any time. 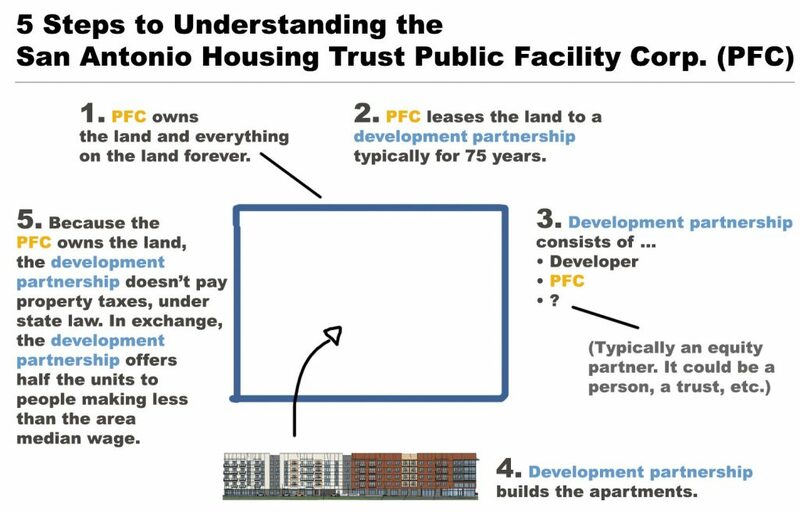 Under state law, a developer that partners with a government-formed public facility corporation (PFC) nonprofit may receive a full property tax exemption in exchange for offering half the units in a development to people making 80 percent AMI or less. Most of the PFC developments up to this point—there are about 15 projects completed or under construction citywide—have offered only 80 percent AMI units. With the West Cevallos apartments, which is proposed for 9.1 acres at 418 W. Cevallos St. a block from Interstate 10, the 60 percent AMI rents are possible because NRP Group has agreed to contribute $250,000 toward an affordability reserve to help “buy down” rents on 10 percent of the units. Confused yet? This is highly complicated stuff, so let’s take a breather and review how PFCs work. Now that that’s a little clearer, let’s continue with the West Cevallos apartments. 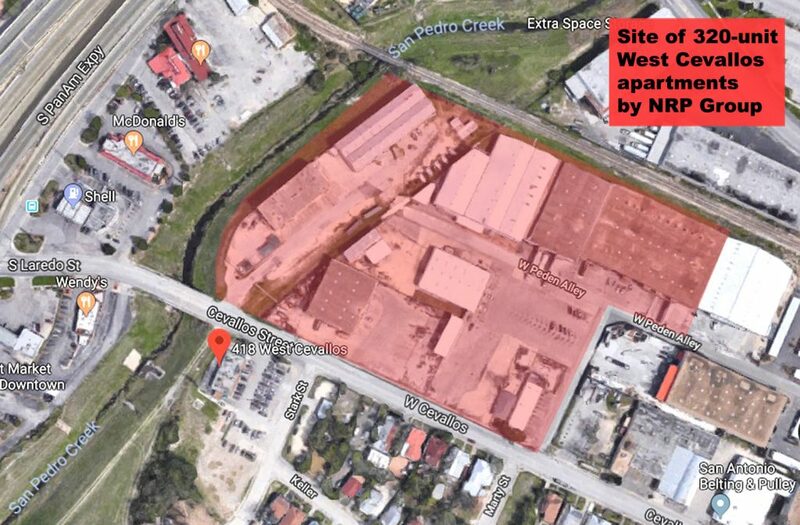 Under the agreement, Cleveland-based NRP Group, which is San Antonio’s most active inner city developer, could switch from offering half “affordable units” to market-rate rents at any time, but in doing so would lose its tax exemption. Plummer told council members that NRP Group’s outside equity partners won’t fund this project if the switch-to-all-market-rate option is not available. “They want to know if they come in a take over the deal, they can sell it without restrictions,” Plummer said. District 5 Councilwoman Shirley Gonzales argued all market-rate rents could be a good thing from the get-go with this particularly project only, because that means these West Cevallos properties would never leave the tax rolls, and therefore the development would yield more revenue for the various taxing entities from the start. Plummer told Gonzales the West Cevallos apartments couldn’t be built as a complete market-rate project because it can’t command maximum rents like developments near the Pearl can. According to county records, the 12 properties where this project would rest are owned by other people or entities. Typically, in development deals, the property is placed under contract by the owner and buyer, while certain technicalities and legalities are worked out, before the sale is final. 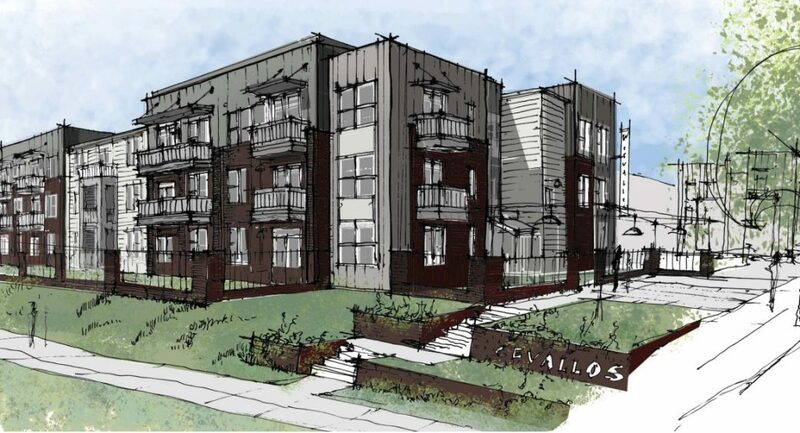 The West Cevallos apartments would be composed of five structures—two facing the creek, two facing Cevallos and a fifth inside—ranging from three to four stories in height. This project would also include surface parking lots worth 516 spaces. The project’s design was given conceptual approval by the Historic and Design Review Commission (HDRC) in September. NRP Group will have to return to the HDRC for final design approval. This stretch of San Pedro Creek has yet to be funded, representatives with NRP Group told the PFC board, which is composed of council members Roberto Treviño, Rebecca Viagran, Rey Saldaña and Gonzales. The West Cevallos project’s rate of return on investment and profit is unknown, as is its other partner or partners who are providing the equity to build it. We also want to know the value of the full tax exemption over the course of the 75 years, should it stay “affordable” for the duration of the lease? Dan Markson, NRP Group’s executive vice president of development, declined to comment after the meeting. We’ve written quite a bit about PFC deals. Click here for our archive.